Terriers’ season came to end with a hard-fought 1-0 loss to UMass Lowell in the Hockey East championship game before nearly 14,000 at TD Garden. One night after BU had put up a six-spot to eliminate arch-rival BC, the Terriers were unable to solve River Chiefs freshman goalie—and tournament MVP— Connor Hellebuyck who stopped all 36 shots he faced. 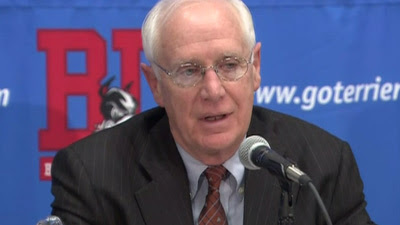 The loss also ends the 40-year coaching career of Jack Parker, who took over the program in December 1973 leading BU to 897 victories, three national championships, four ECAC championships and seven Hockey East titles. Parker's nearly half-century association with Terrier Hockey began in 1964 as a freshman team player, followed by three varsity seasons and being captain as a senior. He spent four seasons as an assistant before taking on the top position. Sean Maguire (photo) gave BU another strong effort in goal especially in the second period when Lowell poured 15 shots on goal. The game-winner came midway through the third period when a 3-on-2 Lowell rush led to a Derek Arnold wraparound goal after Maguire had made an initial save. BU had numerous good scoring chance, but Hellebuyck turned them all away. In the final minute, with Maguire pulled for a sixth skater, Wade Megan’s pass to Cason Hohmann—alone to the goalie’s right with a half-open cage—was slowed down by a Lowell defender, just enough to allow Hellebuyck to recover. The Hockey East All-Tournament team consisted of Lowell’s Hellebuyck, Chad Ruhwedel and Scott Wilson and BU’s Matt Grezelcyk Danny O’Regan and Evan Rodrigues. Both of the two prior Conference championship meetings between BU and Lowell were also one-goal games. In 1994, the Terriers had come out on top, 3-2, and in 2009, BU won 1-0. And in an eerie bit of history, all three times that BU has beaten Boston College in a Hockey East semifinal, the championship game had a 1-0 score. Besides last night and 2009, BU lost the 2003 title game to New Hampshire, a night after Justin Maiser’s hattrick goal beat BC in overtime. BU was appearing in its 10th Hockey East Championship game and had won the title seven times. Friday night’s come-from-behind win came in the 82nd meeting between BU and BC since Jerry York became the Eagle’s coach in 1994. BU’s 6-3 victory made the final tally 38-37-7 in BU’s favor.